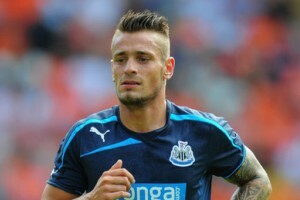 Mathieu Debuchy has been interviewed today while with the French squad, and the Newcastle right back says that there are no issues between the French players and the rest of the players in the dressing room at Newcastle. Newcastle have nine Frenchmen this season in Alan Pardew’s 25-man Premier League squad, and the Frenchmen are playing a big part in the Newcastle first team this season, and all the Premier League goals have been scored by Frenchmen. Whoops, those words from Mathieu seem to go against what Alan Pardew had been saying at the end of last season, that everybody would need to speak English during training, and in the dressing room. But the overall message there from Debuchy is that the team spirit at the club is still very high, and we believe that, even though the Telegraph last April tried to reap some damage when things seemed to be going south, by saying the Frenchman were causing some problems in the dressing room. That was something that turned out be a complete mis-statement of the facts – let’s just leave it at that. Oh dear, another non story. It must be International week and the news is soooooo slooooooww. If the situation was reversed, wouldn’t a bunch of British players speak English in a French dressing room?